So guys, I'm not really much of a mystery kinda girl, but I will always pick up Megan Miranda's books because she brings the creepy and the excitement! I pretty much loved Fractured and was all flailing hands when I got approved for Hysteria! Hysteria was a bit different from what I'd expected, from the summary I'd gathered it would be about Mallory discovering what happened that night. But it wasn't. It's more about dealing with the aftermath than the actual event. Megan Miranda made me connect to Mallory when I was a bit hesitant to. I mean, she killed a boy. And it's the uncertainty about how it exactly happened that kept me wondering, but 'what if', what if she didn't do it in self-defense? How can I like this girl when I don't fully trust her? So I went back and forth and Mallory is a bit all over the place and I LIKED that. It's not natural to be ok when you've ended a life, even if you didn't mean to. I loved seeing all the past events unroll and seeing the whole tragedy for what it was and how teen romances can screw up a life. It was so interesting to work things about alongside Mallory, seeing things she hadn't realized before. But I think that most of all I loved seeing the friendship between Mallory and Colleen. So often in YA novels I wonder how the characters can call themselves friends, but Mallory and Colleen were the real deal. There for each other, fighting but always making it right, just knowing each other through and through. Bonds like these are rare and should be cherished. There was a definite creep factor and a couple of girls just kept me repeating 'witches be CRAZY', except, you know, with the word that isn't exactly PG. I mean seriously? There's something WRONG with some of the people that went to the boarding school Mallory got shipped off to. The hand on Mallory's shoulder: it was there, cause Reid saw it, but was it a paranormal thing or did Dylan do it? Because it never really said and I'm stuck on this. Help? I liked that there was a little romance, even though it definitely wasn't easy. And I really liked Reid, though I thought it was a bit weird that he didn't really seem to care that Mallory had killed someone, even if he believed it to be in self defense. I mean, it's got to be kinda weird right? Knowing that? If I knew a guy had done that I don't think my first thought upon seeing him would be to start something with him. I was going to say 'the last couple of chapters', but who am I kidding? It's lucky that I'm working the night shift and had all this time to spare during the day, cause I just tore through this book in virtually no time at all! 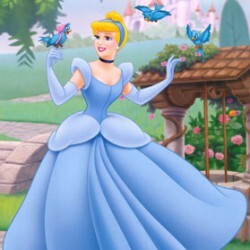 I was so in the story, it was wonderful! 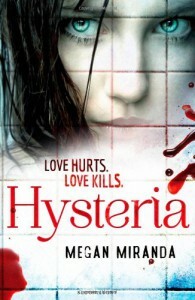 Megan Miranda has an amazing voice and though I think I loved Fractured more, Hysteria was a wonderful read and I will definitely be picking up her next release!